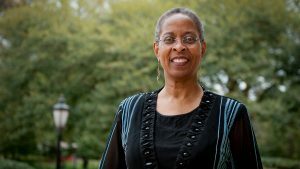 TUSCALOOSA, Ala. — Dr. Trudier Harris, a University of Alabama distinguished research professor of English, is on a roll. After having just received the 2018 Clarence E. Cason Award in Nonfiction Writing March 2, Harris has now been selected as a recipient of the 2018 SEC Faculty Achievement Award and has been named a 2018-19 Fellow of the National Humanities Center. “A National Humanities Center Fellowship is among the most prestigious honors in the country for our discipline, and among the most selective,” said Dr. Joel Brouwer, professor and chair of the English department. “Few organizations have done more to demonstrate the critical importance of the humanities to our national conversation. Harris said she feels blessed to have been selected for the fellowship. “To have been selected as one of 30 people out of 556 applications is pretty special, and it would make any scholar, especially myself, feel blessed that my application caught the eye of the people selecting,” she said. To be selected as a National Humanities Center Fellow, candidates have to meet a strict set of scholarly credentials. Recipients of the residential fellowship spend a year at the center located in Research Triangle Park, North Carolina, working on a scholarly project. The project she’s working on is “Ungraspable? Depictions of Home in African American Literature,” which explores the unexplored topic of what home truly means to African-Americans as expressed in African-American literature. “Obviously, notions of migration in the diaspora have to relate to this,” she said. “How can home be America to African-Americans when they were forced to be on this continent? Harris will take a yearlong sabbatical from UA to become a resident at the center in August. The SEC Faculty Achievement Award is awarded annually to a single faculty member of each SEC university who has excelled in teaching, has nationally or internationally-recognized research and has achieved full professorship. SEC Commissioner Greg Sankey said the awards allow them to celebrate faculty in the conference who’ve made meaningful contributions to students in their respective fields. Harris and the other award winners will receive a $5,000 honorarium from the SEC and will be nominated for SEC Professor of the Year Award to be named in April. Whoever is chosen for that honor will receive a $15,000 honorarium. “I am grateful – and deeply humbled – by this recognition,” Harris said. “It is only because of wonderful students and colleagues that I have been able to reach this point in a career that has garnered this award.